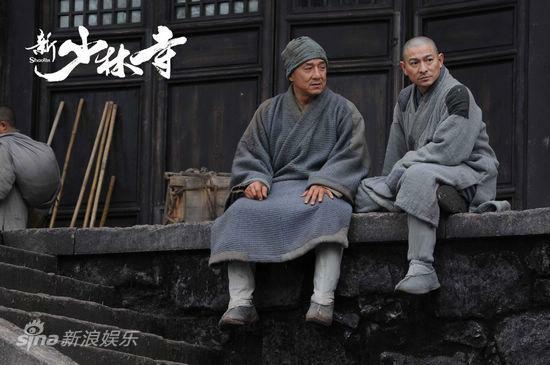 The year’s major kung-fu film Shaolin would open in the cinemas in January 2011 nationwide. The film gathered Hong Kong action film director Benny Chan, action director Cory Yuen, with a cast of Andy Lau, Nicholas Tse, Jackie Chan, Fan Bingbing, Wu Jing. It’s the first time since Andy and Jackie collaborate since Island of Fire in 1990, thus this film capture the attention of the media. Twenty-one years ago, Andy Lau, Jackie Chan, Sammo Hung and Tony Leung Kar Fai collaborated in Island of Fire. Since then, because of their different film genre they did not get a chance to collaborate again. However, this film – Shaolin managed to bring these two superstars Andy and Jackie to collaborate again, however this time round, they switched positions. It is said that Andy’s general character was betrayed by Nicholas Tse resulting to him losing his wife and children, he went into Shaolin Temple to become a monk, initially hope to gain revenge after mastering kung-fu. Unexpectedly he gained enlightenment from the cook (Jackie) whom has high knowledge in Buddhism but does not know kung-fu. 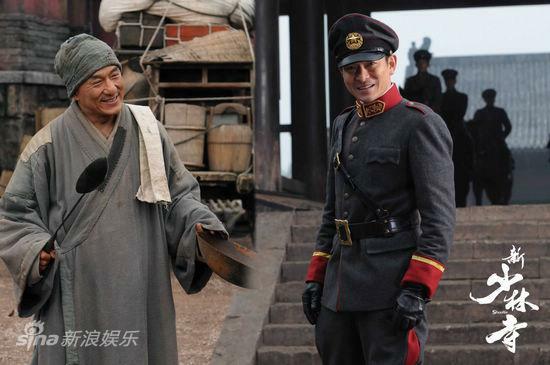 This time round, Andy made a breakthrough of his usual screen image, he was a handsome general whom had exciting fighting scenes against Nicholas and Wu Jing. Andy specially spent three months to practice Shaolin kung-fu as he managed to show off his realistic Shaolin’s 7-Star Fist. As Andy was too concentrated in the shooting, he got injuries in his right fist and legs. With regards to Andy’s kung-fu, Jackie exclaimed that Andy is a fast learner and able to become an action star, he has his own fighting style. When talked about his cook monk character, Jackie revealed that he learn some cooking skills from his father, he also showed off his cooking skills in A Nice Guy and Wheels On Meals, however this cook monk character still has some difficulties for Jackie, “I made a lot of noodles today, it isn’t hard for me, cooking is another kind of kung-fu. I’m also good at changing the actions in cooking into kung-fu. The most difficult is when I need to say out those dialogues which are like sutra I’m making noodles or frying vegetables.” Andy also revealed that Jakcie was very popular among the children, “He would fry fish for the children, I had yet tasted his cooking.” It is said that both of them had no airs as htey mix around with the little monks. Andy also became the “king of children” by helping the little monks to choreograph dance.